This week I have a photograph with a monochrome palette for you. It was taken by Vivian Maier who was an American street photographer. Her selfie in black and white is undated but her best known photographs were street scenes in Chicago and New York in the 1950s and 1960s. There is a certain mystery with black and white photos and this one is no exception. I would say it’s as mysterious as the woman who took it. By the way, have you seen the documentary film about her called Finding Vivian Maier? I haven’t yet, but look forward to it. When I think of the combination of black and white together with regards to fashion, many words come to mind: bold, classic, elegant, sleek, minimal. These two contrasting colors are quite easy to use in garment sewing. A very classic look is a white top with a black bottom. Who doesn’t love a black and white striped t-shirt? And don’t forget about color blocking. 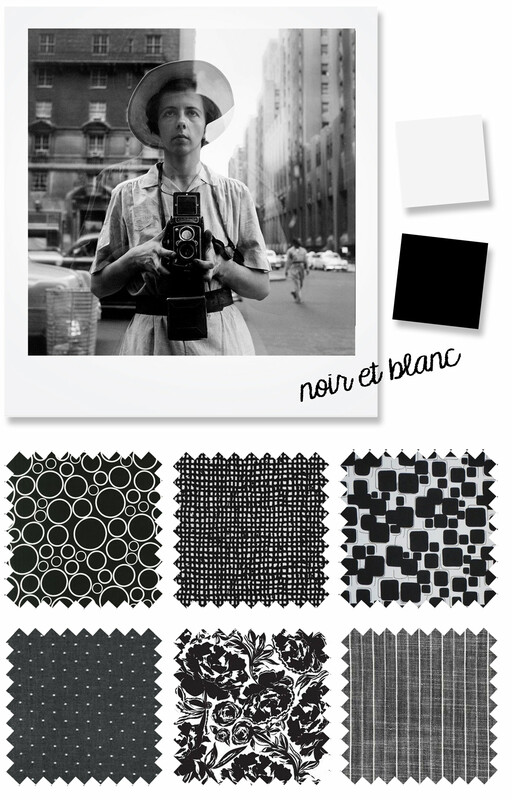 Maybe you are inspired to use noir et blanc when sewing up one of the new Liesl + Co. releases. All of these and more color inspiration images and fabrics can be found on the color palettes and fabric Pinterest board. I adore your color palettes! I have been using them as an inspiration for outfits on Polyvore. Come check out our Polyvore account (http://skirtfixation.polyvore.com) to see your fabulous color palettes paired with fabulous clothes! Allegra, that’s amazing! Thanks so much for sharing! I’ve seen the Vivan Maier documentary twice- its part of an arts strand on the BBC called Imagine and it was so good that I had to watch the repeat a few months later. The photographs are incredible- every single one of them.